Shown here is panel one of six 4 x 8 foot painted panels that comprise the mural. The client had only one request. The site-specific mural he commissioned Peter Macara to paint, must include a lighthouse–an extremely vertical element–in the extremely horizontal space (48 inches by 48 feet). Rather than limiting Peter’s vision, the request helped to shape his idea. The artwork was commissioned by Craig Russell, president of Land’s End Marine Supply Inc., a local family-owned hardware store established by Peter and Craig's uncle, Joe Macara. A view of the entire mural would greet the eye at the recently renovated entry, but the mural would reveal itself only gradually when walking from the front entry to the back of the store. 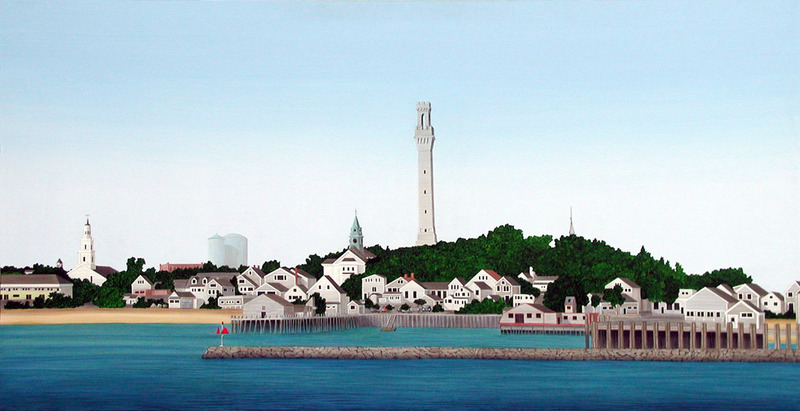 Peter recognized this as the ideal space to paint his experience of approaching Provincetown from the bay. The subject of the mural would be his stylized view of the waterfront, including Long Point Lighthouse, as it was revealed to generations of fishermen and sailors returning home from the sea. Painting from a montage of digital photographs over two consecutive winters, Peter moved among the six 4x8’ masonite panels to create this colossal mural–perhaps the largest painting ever shown at the Provincetown Art Association and Museum (see newsletter, PDF), and the only known extant painting of the entire Provincetown waterfront. The style emulates a “typical” lighthouse picture postcard view, and avoids overwhelming its subject. A work of this size presents special challenges. Peter’s 20x20’ studio was physically limiting; it allowed him to work on only two panels at a time. To create smooth transitions between panels and to assure that all six panels would mature at the same rate, he shuffled them. After prime coating with a pale blue, he chose a traditional technique, using sepia for underpainting, then layering transparent colors on each panel. Such layering of semi-transparent color glazes with brushes, and the incremental, careful removal of those layers with natural sponges, resulted in warm shadowing in some areas, cooler shadowing in others–sometimes in surprising ways. or directly from the artist: pmacara@capecod.net.